Wink, the newly launched smart home spin out of product design shop Quirky, showed off an impressive list of partners and a new hub at an event on Tuesday in New York. But its new hub shows that even if you want to design software for the home you need to start with hardware. In this case, Wink has a home hub that offers a variety of radios — including Lutron’s Clear Connect — that will sell for $79.99. The hub will go on sale July 7 at Home Depot(s hd) stores, and I plan to pick one up to check out how Wink compares with all of the other efforts out there to integrate one-off connected devices and sensors into some unified system. As an FYI Home Depot will run special pricing through Labor Day the hub costing $49.99 alone, $24.99 if you buy the hub with one compatible product and 99 cents if you buy it with two or more connected products. Wink’s software will work with a huge number of partners, including Bali (window shades), Kidde (smoke detectors), Kwikswet (locks), GE(s ge) Ovens and Lighting, Lutron (lighting and shades), Schlage (locks), Chamberlain (garage door openers), Dropcam, Honeywell (thermostats), Rachio (sprinklers), Philips Hue (lights), Rheem (water heaters) and TCP (lights). These devices will rely on the hub to handle the radio conversions and shoot information back to the cloud, where the logic for the devices will live. Without the hub, consumers can use the Wink app to control all GE/Quirky devices such as the Aros A/C unit, a newly launched, connected propane tank and others. After scanning the list of partners, I will say that the Wink hub looks like a good choice for someone who is interested in connecting their window shades. 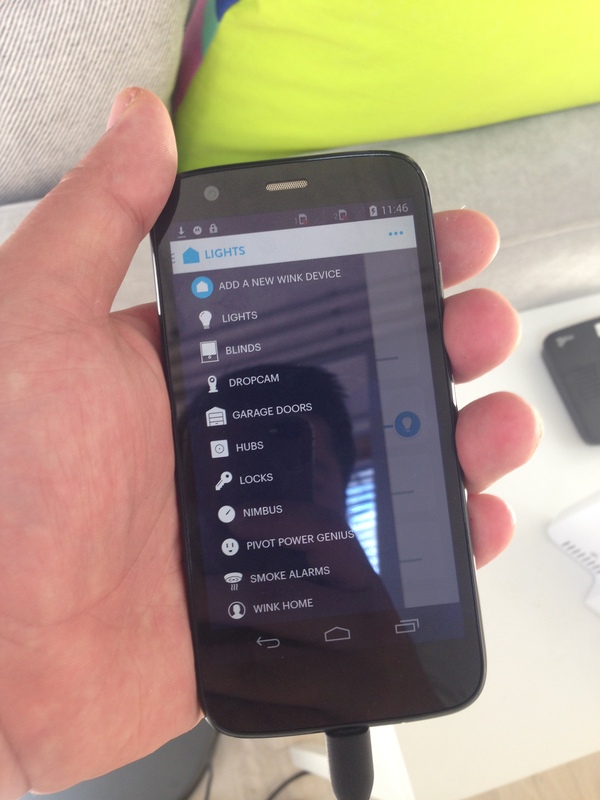 Both Lutron and Bali have connected, motorized shades and an adaptor that uses Zigbee or Z-wave (also supported by the hub) which could help update older Hunter Douglas shades that use the Somfy radios. 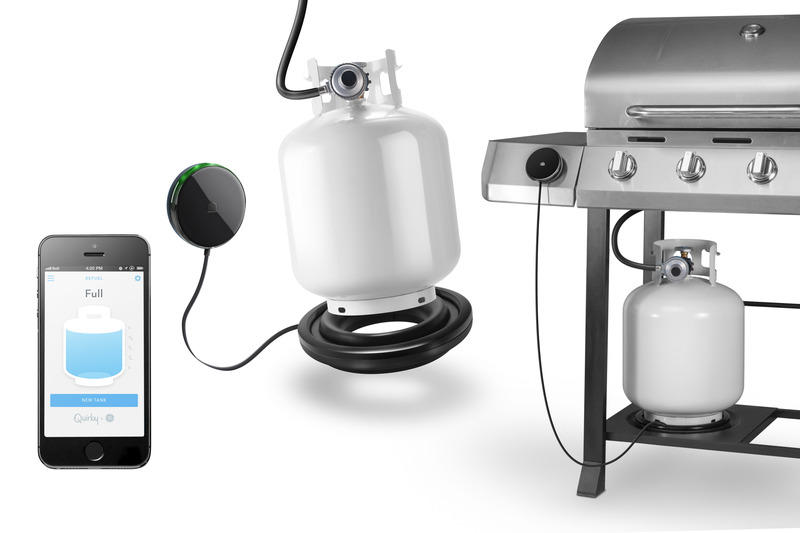 The Refuel $49.99 connected propane tank monitor may be useful for BBQ season. Since a ton of people have asked me about my own connected shades (I use a $600 Zigbee converter for the Somfy connected to my SmartThings hub) I will warn people that connecting your shades takes something that is pretty expensive and makes it even more so, but ultimately it is worth it if you want to optimize natural light but live in a hot climate. The only other hub on the market supporting Lutron to my knowledge is the Staples(s spls) connect gear, although Revolv does have a Lutron radio in its hub that isn’t active. So stay tuned and in a week or two I’ll give a play-by-play on my life using the Wink system once I get a hub and some gear installed. Update: I updated this story at 9 am PT to add more pricing details and correct the original hub price. It is $79.99 not $100. There is such a disparity in the price. You and some others say 100. One report said 50. Another says that if we buy one device it comes down to 10 and buying 2 devices, the price goes to 1. I can not wait for 7th just to find out the true price.